£545 worth of superb ORTLIEB bikepacking bags must be won! Our dear friends at Lyon Equipment, UK distributors of ORTLIEB, have teamed up with us to offer one extremely lucky reader the chance to win a complete set of bikepacking bags, in fact probably more than enough bags to take you round the world, if that takes your fancy! ORTLIEB's bikepacking range draws on the brand’s 30 years of experience in making welded waterproof cycling luggage. As with all products in ORTLIEB's portfolio, the bikepacking bags are made in Germany which helps to keep the environmental footprint of manufacturing low and quality control high. 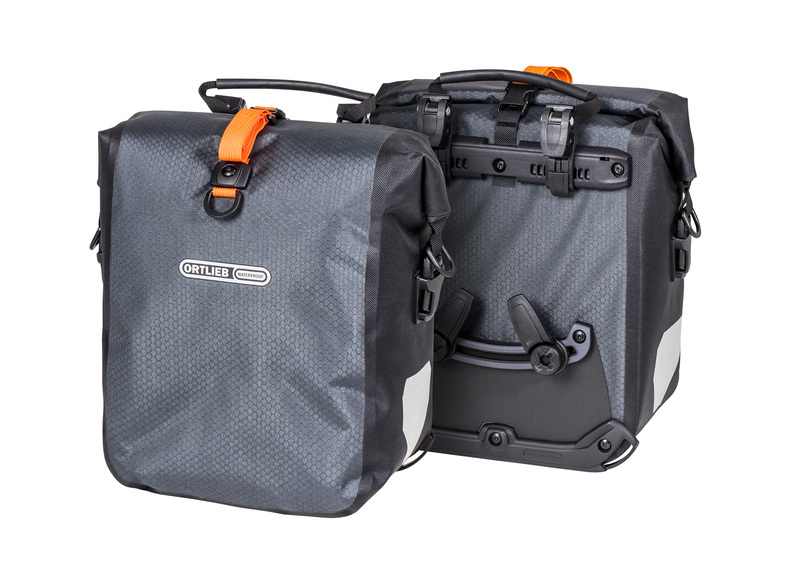 As a result, all ORTLIEB products are backed by a 5-year warranty. The winning reader will win all of this kit. Yes, all of it. It's just not fair, is it? So, let's unpack this a little further (sorry!) and have a closer look at each bag you (well, it might be you) are going to win. 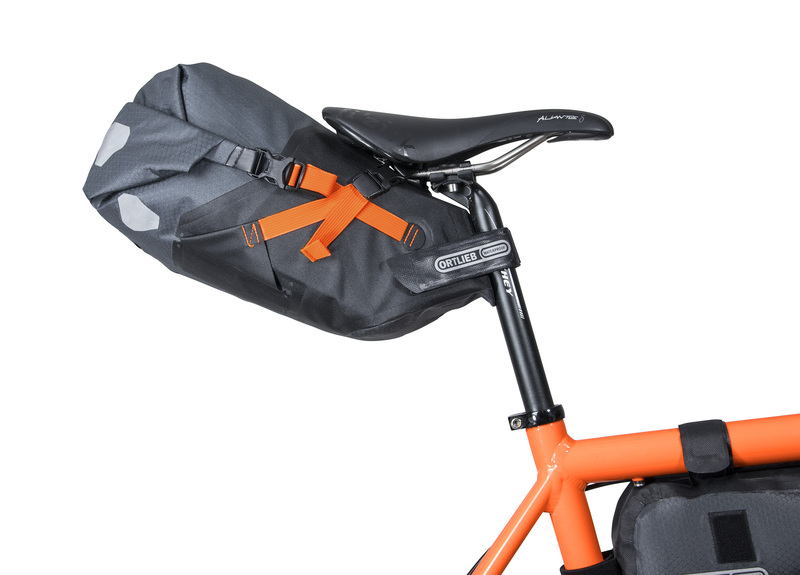 As a key item in your bikepacking setup, the ORTLIEB Seat-Pack comes with Velcro straps to enable convenient and secure mounting to your saddle and seatpost. Projecting backwards from the seatpost, the Seat-Pack also serves as a rear mudguard. The spacious, waterproof Seat-Pack keeps its contents (e.g. an extra set of clothes) safe and dry. Depending on how long you plan to be away and your Seat-Pack model, you can conveniently adjust the volume of your pack from 7 to 11 litres by adjusting the roll closures on the sides. An additional valve allows you to quickly and easily compress your soft gear for a more compact fit. The waterproof ORTLIEB Handlebar Pack is an indispensable item when you’re on a bikepacking trip in the great outdoors. The Handlebar-Pack offers a 9 litre capacity for light and compressible items, like your sleeping bag and pad. Thanks to the roll closures at both ends, you can always gain quick access to your gear. Compression belts on the outside enable the stowing and attachment of additional equipment. The Handlebar-Pack comes with four hooks to enable the attachment of an ORTLIEB Accessory-Pack for additional carrying capacity. Consisting of spacers and two strong Velcro straps, the mounting system ensures secure attachment to any handlebar type, including carbon handlebars. The pack’s stiffened interior and head-tube attachment offer additional stability – in any terrain. What should you do with all those small, but important extras on your bikepacking trip? The best place to put your snacks, smartphone, wallet and other items is in your ORTLIEB Accessory-Pack. This convenient volume expander for your Handlebar-Pack keeps your things secure, absolutely waterproof and quickly accessible at all times. Use the metal hooks to securely attach the Accessory-Pack to the four points of attachment on the Handlebar-Pack. And if you don’t plan on spending the night outdoors and don’t need your Handlebar-Pack, you can still use your Accessory-Pack as a handlebar bag thanks to its pre-mounted Velcro straps. You can even use the carrying strap to transform the lightweight bag into a shoulder or hip bag. The submersible ORTLIEB Toptube Frame-Pack is the smart solution for all who want to use their frame’s main triangle for storage space without having to do without their water bottle. With its 4 litre payload, the Toptube Frame-Pack provides plenty of space for heavy equipment such as tent poles, tools, and food supplies, while also helping to secure a low centre for improved rising performance. And given that the bag and its zipper are waterproof, you can even cross rivers on your bikepacking trip without worrying about your stuff getting wet. Weighing next to nothing and incredibly practical, the Cockpit-Pack helps to secure your personal fuel supply by giving you direct, one-handed access to your favourite snack whilst riding. The large opening ensures that you’ll immediately find what you need. Whether you want quick access to your snack, smartphone or camera, they can all be optimally packed in the Cockpit-Pack. Thanks to the stiffened material on the inside, the bag retains its shape at all times and can be easily opened and closed. The 82-gram, lightweight Cockpit-Bag is waterproof and attaches easily with its extra strong Velcro straps to your top tube and head tube or to your top tube and seat tube. Ideal for multi-day trips and self-supported races, the ORTLIEB Gravel-Pack duo offers you a combined capacity of 25 litres for additional gear such as mess kits, food, and other “luxury” items. Mounting the Pack to your lowrider bike rack allows you to maintain a low centre of gravity and undiminished off-road agility despite your extra gear. A pretty impressive set of prizes, yes? And whether you just want to use a bag for commuting or you want to do that Patagonian Adventure you've always dreamed about, you've got everything you need with this bikepacking prize extravaganza. So, all you have to do now is enter. As usual, everything you need to fill in is right below. Get to it. If you would like to join The Lyon Equipment mailing list to get updates on Ortlieb products please type Yes in the box. You can leave this mailing list at any time by emailing newsletter@lyon.co.uk or unsubscribing from them via the unsubscribe link in any emails you may receive. The competition will run until midday on 29th April. Employees of Farrelly Atkinson, Lyon Equipment and Ortlieb, their families and agents are excluded from entering. Only one entry per person. Multiple entries and automated entries will be identified and deleted at the sole discretion of Farrelly Atkinson. The winners will be drawn at random from all the genuine entries and notified using the email address supplied on entry. Farrelly Atkinson is not responsible for non-receipt of a winner's email. Should a winner not respond within seven days of the sending of the winner's notification, another may be randomly selected at the sole discretion of Farrelly Atkinson. The name of the winner will be posted on road.cc following the draw. The prize is as described above; no cash alternative will be offered.